On November 30, sophomore Katie Meitchik hosted a silent art auction with Kids for Peace. 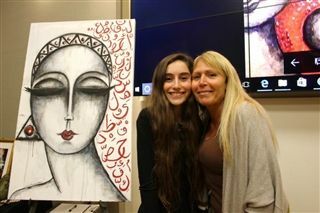 Syrian art therapist Massa Abujeib painted special pieces for the evening event which raised over $2,500. Katie became interested in the Syrian refugee crisis after learning about it in her Modern World History class. Ms. Abujeib will take the funds back to Syria to work with homeless refugees.